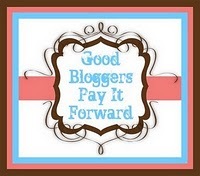 I have been a lucky girl this week and have been awarded the ‘Good bloggers pay it forward’ award by not one but two lovely bloggers; the lovely Liska from NewMumOnline and the fantabulous Mrs E from Mummy, Daddy and me makes three. It is so flattering when someone says they like what you do and it makes you feel warm and bubbly all week. 1. Put the badge at the top of your post – done! 2. Refer to the lovely blogger(s) who awarded it – also done! 3. Pass it on to five others. – Here you go! I have had to think hard about this, there are some fabulous bloggers out there so finding some that have not been tagged already may be hard. Sorry if you already have been. 1. Anthea from Blue Bear Wood – She is brand new, literally brand new and she needs the same kind of support we had when we started out. She has on;y written a couple of posts but spur her on! 2. Donna from Not yet a Yummy Mummy – She is suffering from severe hyperemesis which I can totally relate too and how she is still finding the energy to blog I don’t know, but she’s fab! 3. Kelly – Writings, ramblings and reviews – A lovely lady who has tweeted and supported me from the beginning and also has a fabulous blog. 4. Jenny from Mummy mishaps – Not only do I fancy her as a bloke – check this out! (This is a joke and i am not some freaky stalker type! ), she is very funny and just lovely. So there you go, my attempt. Go and pass the good feeling on! Hee hee I see what you have done there!! Thanks for the tag I am flattered!